Profiled in the New York Times, New York Post and New York Observer. Featured on "This American Life" and The Moth. Endorsed by the NYC Patrolmen's Benevolent Association. Included in the library on board the USS New York (US Navy LPD-21). "Riotously funny and deadly accurate." "Mr. Bacon was about as good a cop as one could hope to have walk this city." "I loved it...you hit a lot of [sh-t] right on the head. Nice work." "Unexpectedly funny." --WNYC's "The Brian Lehrer Show"
"A quick read...a wonderful perspective on the daily lives of police officers." --Peter Moskos, author of "Cop in the Hood"
"Fascinating." --NPR's "The Sound of Young America"
"Extremely well written." --Air America's "Doing Time with Ron Kuby"
"Good thing for readers everywhere...and the citizens of NYC in particular..."
"Hilarious and illuminating. You'll never look at a cop on the corner the same way again." "His swift, affable style makes good use of his trying experiences on the force. Entertaining and surprising--this book makes a perfect summer read." "Itï¿½s a clear-eyed look at the day-to-day of police work thatï¿½s also very funny. 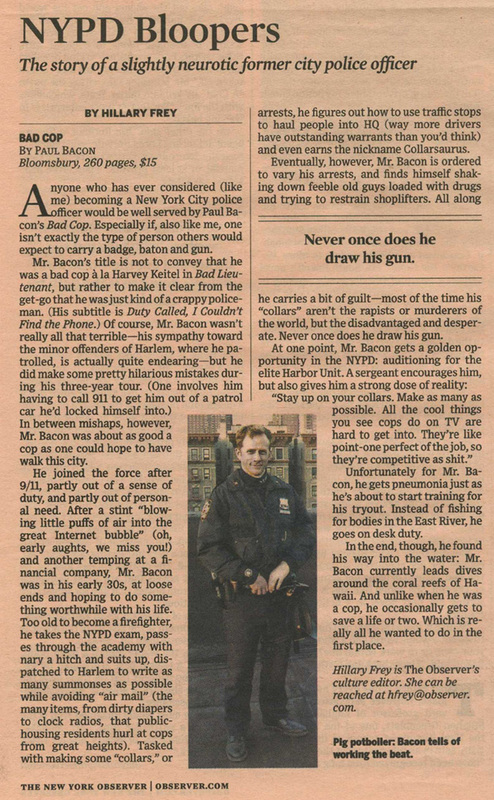 As you might expect from a cop named Bacon." "Like a season of 'The Wire' written by David Sedaris." --Neal Pollack, author of "Alternadad"
"Bad cop, good copy. Paul Bacon's one-of-a-kind memoir is simultaneously very funny and joltingly real. Book this book." --Mark O'Donnell, author of "Let Nothing You Dismay"
"I bought your book today...the Barnes and Nobles staff was pissed because I ruined the giant "Bad Cop" pyramid they had set up next to the entrance." 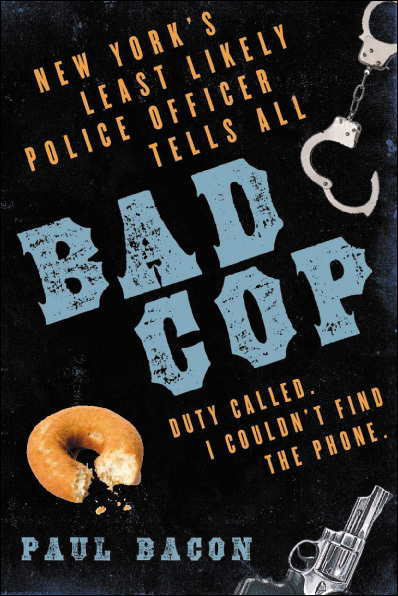 "I read Bad Cop over the weekend... and I kid you not - I laughed out loud through the first half and couldn't put it down until I finished. I loved his writing style... very conversational - like he was sitting next to me with a glass of wine telling the most hilarious stories. He is so funny! As a fan of cop shows, this book was another point of view I hadn't read before. What an enjoyable way to spend a weekend. 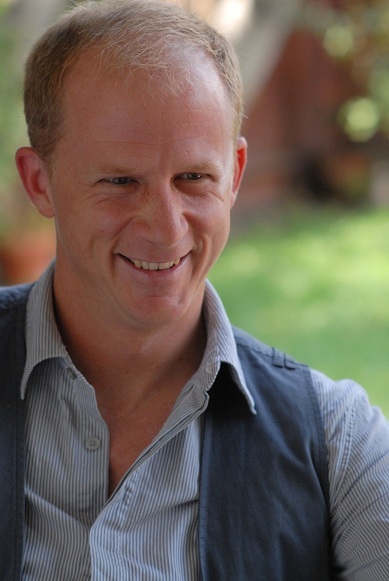 Suggestion for Paul Bacon: now go write a book about your diving job." "Painfully funny and original. I hate reading but I could not put this one down." "I loved this book. I laughed so hard at times I had to remove my steamed up glasses to wipe the tears away. Paul Bacon's wonderful wit and storytelling ability kept me enthralled from beginning to end. If you enjoy stories and books by David Sedaris you will love this book." "Honest and refreshing...an easy, conversational style. I highly recommend this book." "I cracked up more than a dozen times...Great stories." "Some of us are able to achieve the helping-people-out part, in spite of the job...I applaud your courage...By the way, I got locked in the back of my patrol car too." "What He Learned as a New York Officer"
Campaign for the American Reader: What is Paul Bacon reading? Radio Interview: WNYC's "The Brian Lehrer Show", March 16, 11:40 a.m.
Book signing: New York City Police Museum, Downtown Manhattan, March 18, 12 p.m.
Book signing: Partners & Crime Mystery Booksellers, Grnwch. Village, March 19, 7 p.m.
Radio Interview: Air America's "Doing Time with Ron Kuby", March 26, 3:45 p.m.
Book signing: Barnes & Noble, Park Slope, Brooklyn, March 28, 2 p.m.
Radio Interview: The Jay Thomas Show, XM/Sirius Radio, March 39, 4:35 p.m. Listen to author's appearance on NPR's "This American Life"
NYPD Rant "Negative book humped by the PBA (?)"